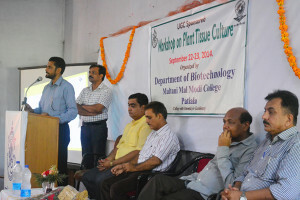 Department of Biotechnology, Multani Mal Modi College, Patiala organised UGC sponsored Two-Day workshop on Plant Tissue Culture, Forty participants from different colleges attended the workshop. In this inaugural address Dr. Khushvinder Kumar, Principal of the college said that practical training to the students supplemented with theoretical knowledge is must o develop entrepreneurship among the youth. Such workshops enable the participants to be self-reliant and well-equipped with practical training to fetch good jobs in private sector and educational institutes. 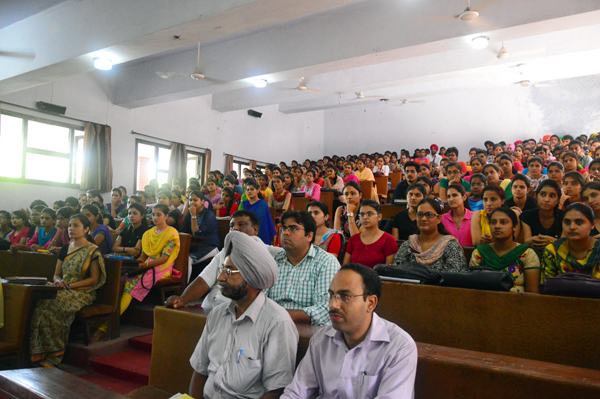 Dr. Anil Kumar, Associate Professor, Thapar University, Patiala delivered the Keynote address. Dr. Kuldeep Kumar, Head of Biotechnology Department, informed that during workshop the participants were trained in the preparation of stock solution and media, sterile techniques and explants preparation, shoot induction and multiplication, rooting of shoots and plantlet acclimatization. Dr. Diwakar Aggarwal, Dr. Mandeep Kataria, Mr. Sanjeev Kumar and Ms. Teena Pathak conducted the practical sessions successfully. Dr. Rajeev Sharma, Dean Research, proposed the vote of thanks. Principal, Dr. Khushvinder Kumar, presented the certificates to all the participants.